If you enjoyed Independence Day-ing last weekend, get ready for round two: this time, with a French twist. Bastille Day is July 14, and you won't have to go far this weekend to join in on the -- um, what's the French word for fun? From French mines to French food, D.C. is home to a number of Bastille Day festivities. Here are five ways to have a blast this weekend. The L'Enfant Cafe (2000 18th St. NW) is closing off the street Saturday for an-all day party in honor of French independence. Gates open at 3 p.m. in Adams Morgan. Head to 18th Street and Florida Avenue for the music, food trucks and a beer garden. Stick around for the can-can dancers, French maid race and a chance to win a trip to Paris. There's also "D.C.'s largest Masquerade Street Ball" to look forward to, starting at 9 p.m. You can buy advance tickets for $10. To get the whole family in on the French festivities, try this festival at Hillwood Estate (4155 Linnean Ave. NW) near the Van Ness-UDC Metro stop. From live music to games to 18th-century French art, there's plenty of Francophile fun to be had -- plus there's the promise of mimes! Tickets are $18 for adults, $15 for seniors, $10 for college students and $5 for chidlren ages 6-18. If you're still thinking of fries and toast, this meal will expand your French food horizons. Head down to Old Town Alexandria this Sunday to get a taste of a special menu by a French chef. 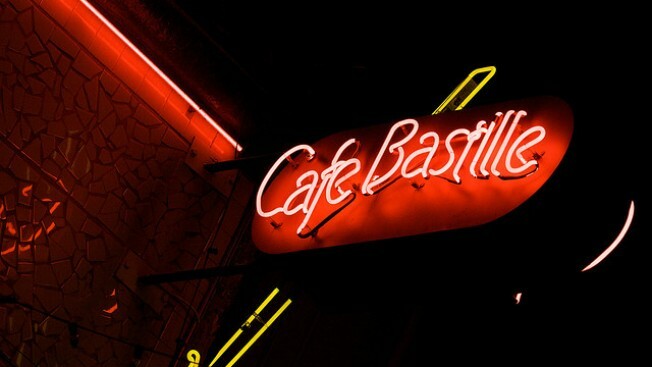 Bastille Restaurant (201 N. Royal Street) will be serving a prix fixe menu from 11:30 a.m. to 8:30 p.m. celebrating the holiday that shares its name. The meal is $39 and food is also available separately from the a la carte menu. The Embassy of France is opening their doors for a swanky evening celebration on Friday. With jazz and swing band sounds from the world renowned Doc Scantlin and Chouchou, you may learn a few new French dance moves. The event kicks off at 7:30 p.m. and ends at midnight. At $110 for general admission, this soiree is a little bit on the pricey side, but all profits will benefit Comite Tricolore's charities. How about a croissant or a cappuccino to cap off your French celebration? Le Diplomate cafe (1601 14th St. NW) is offering cocktail specials and Bastille Day-themed foods on Monday, July 14. Word on the street is there might be a mime appearance, too. The grand occasion is only for dinner Monday and begins at 5 p.m.